Manila, Philippines - State weather bureau PAGASA said that 'Bagyong Jose' has gained more strength as it continues to move in west northwest direction based from released weather bulletin as of 11:00am on Sunday, August 3, 2014. At 10:00 AM today, the eye of 'Bagyong Jose' was spotted based on all available data at 1,100 km East of Casiguran, Aurora (15.4°N, 133.6°E). Tyhoon Jose has a maximum sustained winds of 185 kph near the center and gustiness of up to 220 kph. It is forecast to move West Northwest at 11 kph. Typhoon Jose is expected to be at 870 km East of Casiguran, Aurora by tomorrow morning and at 800 km East Northeast of Aparri, Cagayan by Tuesday morning. By Wednesday morning, it is expected to be at 800 km East Northeast of Basco, Batanes. The estimated rainfall amount is from 10 – 25 mm per hour (heavy - intense) within the 650 km diameter of the Typhoon. 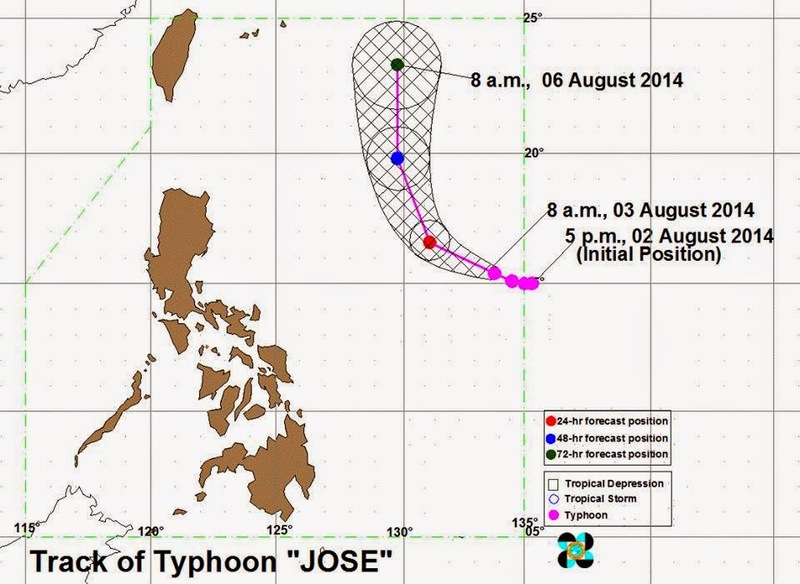 Typhoon Jose will not yet affect any part of the country. However, the Southwest Monsoon (Habagat) will continue to bring occasional rains over Metro Manila, Central Luzon, Ilocos Region, CALABARZON and MIMAROPA. The public and the disaster risk reduction and management council concerned are advised to take appropriate actions and watch for the next bulletin.